Expectations of an interest rate cut could keep pushing the Kiwi lower against its counterparts while the Aussie could stay afloat due to the RBA’s neutral stance. Here’s what I’m seeing on AUD/NZD. The pair formed a double bottom on its daily time frame, signaling that price is ready to pull up from its dive. Of course AUD/NZD has yet to break past the reversal pattern’s neckline at the 1.0750 minor psychological resistance before confirming that an uptrend is underway. The upcoming Australian quarterly CPI release could be a catalyst for a break higher as market watchers are expecting to see a 0.5% increase in price levels for Q3, slightly faster than the previous period’s 0.4% gain. Stronger than expected results could be enough to assure Aussie bulls that the RBA won’t be lowering interest rates in the near future. There are no major events lined up from New Zealand this week but expectations of an interest rate cut for the next RBNZ meeting on November 10 could keep a lid on the Kiwi’s gains. 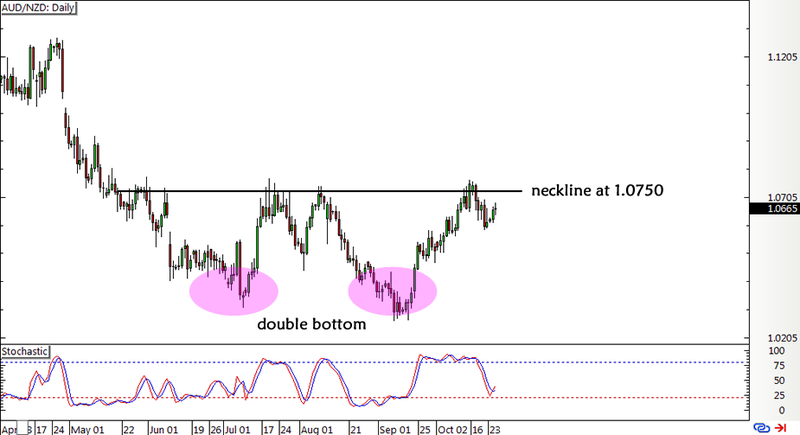 A break past the neckline resistance could take AUD/NZD up by around 400 pips, which is roughly the same height as the double bottom formation. If I’m able to hop in a long position around 1.0800, I’ll aim for the 1.1200 area with a stop just below 1.0600 for a potential 2:1 trade.